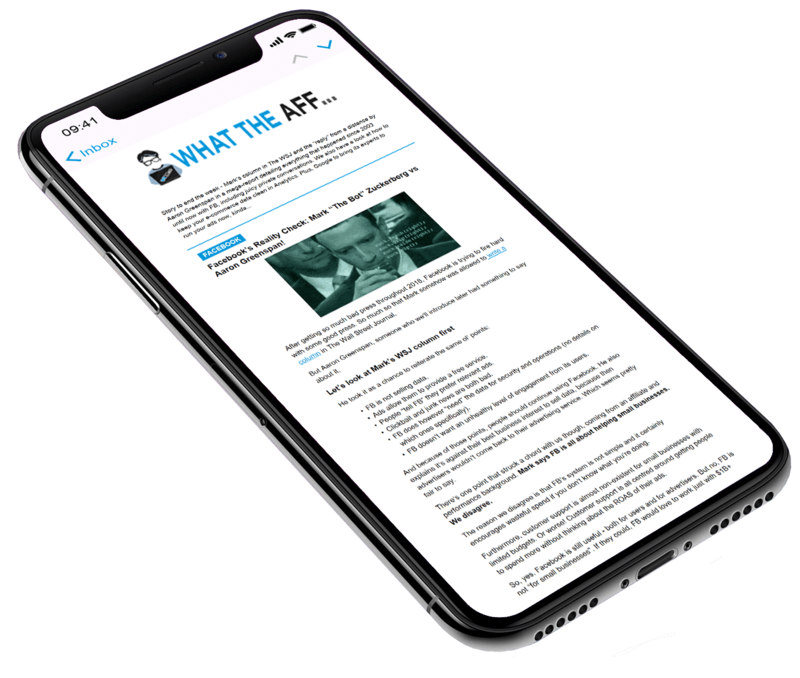 January 25, 2019 - The digital marketer's #1 daily briefing! Facebook’s Reality Check: Mark “The Bot” Zuckerberg vs Aaron Greenspan! After getting so much bad press throughout 2018, Facebook is trying to fire hard with some good press. So much so that Mark somehow was allowed to write a column in The Wall Street Journal. But Aaron Greenspan, someone who we’ll introduce later had something to say about it. FB is not selling data. Ads allow them to provide a free service. People “tell FB” they prefer relevant ads. Clickbait and junk news are both bad. FB does however “need” the data for security and operations (no details on which ones specifically). FB doesn’t want an unhealthy level of engagement from its users. And because of those points, people should continue using Facebook. He also explains it’s against their best business interest to sell data, because then advertisers wouldn’t come back to their advertising service. Which seems pretty fair to say. There’s one point that struck a chord with us though, coming from an affiliate and performance background. Mark says FB is all about helping small businesses. We disagree. The reason we disagree is that FB’s system is not simple and it certainly encourages wasteful spend if you don’t know what you’re doing. Furthermore, customer support is almost non-existent for small businesses with limited budgets. Or worse! Customer support is all centred around getting people to spend more without thinking about the ROAS of their ads. So, yes. Facebook is still useful – both for users and for advertisers. But no, FB is not “for small businesses”. If they could, FB would love to work just with $1B+ brands. Mark just tried to appeal to “the lil’ guy” but it’s a very shallow way of doing it. Doesn’t mean FB doesn’t work for small businesses but they are far from making things as easy as Mark portrays them. Our 2 cents on it at least. It’s unavoidable that whenever FB tries to clean up their name, someone comes with the opposite. And so here’s Plainsite and its Reality Check report on Facebook. It’s a doozy. 75 pages that go through all of Facebook’s history. Actually, it starts before the whole thing had a name. The author, Aaron Greenspan, was the creator of houseSYSTEM, which later became the first “The Facebook” at Harvard. Allegedly. You can read Aaron’s own words here. Private conversations between Mark and Aaron from the pre-launch times. An analysis of Mark’s philosophy and character. The media’s role in Facebook’s growth. Facebook’s perceived advantages and unrecognized risks. Major claims about 50% of accounts being fake, from FB’s self-reported data. And 2.8B since the beginning of FB. Analysis of all big scandals (Russia, CA, Extortion, fake news, etc). “Mark Zuckerberg does not deserve his billions. He deserves a jail sentence. He is unfit to lead a publicly traded corporation. Time and again he has shown that he cannot be trusted. The report seems pretty legit. It looks at the data reported by Facebook itself to bring up the 50% figure for fake accounts. Of course, there’s some bad blood between Mark and Aaron, that’s pretty clear. But Aaron mentions it from the very beginning that he is certainly biased in his thoughts and conclusion here. That said, the “bad press” of today is definitely much stronger than Mark’s half-hearted excuse in The WSJ. If it were a battle, Aaron won in our view. We do hope Aaron’s conclusion that FB could/should go bankrupt from others liabilities doesn’t become reality. As advertisers, even if it’s sometimes annoying, it’s a platform that can indeed help businesses launch and grow. Even if FB clearly exaggerates when they say they love small businesses. One of the very common questions we receive from you ladies and gents is about the discrepancies in analytics data vs ad platform data. Sales numbers or website conversion values reported by Facebook or Google don’t match up with analytics data. Well, maintaining the accuracy of your data, especially when it comes to e-commerce, is a critical part. So, how confident are you that the data in your Analytics reports isaccurate? Can you imagine a scenario where a large part of your marketing efforts are based on skewed data like test orders or multiple duplicate orders? Marketing efforts based on such data will only lead to inaccurate decisions. And it’s very common for that to happen with a majority of e-commerce owners. It all begins with your shopping-cart tool. Shopping carts handle sales data including cancelled orders, unfulfilled orders, test orders, promotions and refunds much better than Google Analytics. You can avoid that. Make sure you have access to your shopping-cart tool. Even “View-only” access works fine. Duplicate orders are recorded when your order confirmation page is loaded more than once by the same user without placing an order. For example, when a user is refreshing the page. Make sure the user cannot access the order confirmation page more than once without placing an order. Make sure the order confirmation cannot be refreshed. Make sure data from your staging website (the one used during the website testing phase) is not tracked anywhere. Download this Custom-Report in your Google Analytics and select Reporting view. Set data range to last 1 month and look at the Transactions column. Any values greater than 1 means duplicate orders. Rinse and repeat this simple process every week. You can reverse an e-commerce transaction. You can remove or modify e-commerce transaction in one-click. You can even identify negative transactions. You can make changes to your e-commerce tracking code using the steps mentioned above for reversing an e-commerce transaction. You can alternatively use “Data Refund Report”. With these steps and the extra links in the cool source article by OptimzeSmart, you can be more certain of having clean Google Analytics data to work with. Here’s to more informed and accurate marketing decisions. 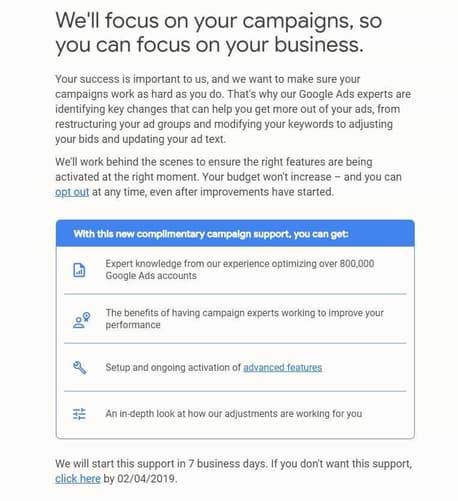 Google is bringing in its own Ads experts to manage your campaigns behind the scenes. Aaron Levy, director of PPC at Elite SEM, tweeted the email Google has sent out to some accounts. In the past, Google has been pushing automation to every aspect of campaign creation and management. But this Pilot-program is going to be completely human-powered. Though, it won’t be wrong to assume that the changes these experts make, will be largely influenced by Google’s machine-powered recommendations engine. This will have immediate implications for advertisers that have this “Opt-in” service turned on. What kinda changes will they make? Setup and ongoing activation of advanced features. Ensuring the right features are being activated at the right moment. The only thing they won’t touch is budgets. Ooooh and they don’t promise that the changes will help. But there will be… changes. “Advertisers are still responsible for the results of their campaigns and shouldn’t put blind faith in its optimization efforts. It doesn’t promise any particular results from implementing these changes made by its experts”. Though, they also mention that if the recommendations have a negative impact on results, Google may offer refunds to advertisers. But who really wants to get into that kinda time-consuming stuff. Check your emails. Unless you opt out, your ad accounts will be added to the program automatically after seven days of receiving the email. Strangely, the opt-out links as of now are only available through the emails they sent out to advertisers which takes you to the account login link. Though, it is possible to opt out later at any point. The affiliate forum that can LIFT you up! You know how most affiliate marketing success stories start? With how helpful having a community of like-minded to advise you on your first steps in this industry can be! And what we’re recommending you today is one of the friendliest and uplifting communities we’ve seen in the past year. affLIFT is the brain-child of industry veteran Luke Kling, aka LukePeerFly. It’s a forum designed for those taking their first steps in affiliate marketing, especially in paid traffic. There are tutorials and follow alongs for pops, search, push traffic, social traffic to name a few. Luke is extremely active both when it comes to sharing case studies but also in getting more and more industry experts to join. As we said, The Crew is also represented on the forum, through Manu. Aside from that, affiliates like Servando Silva, Ian Fernando and Erik Gyepes are also affLIFT members. So you’re probably wondering… How much? It’s a mere $20/month if you pay monthly. But Luke has set up a lifetime membership fee at $350 as well. So, if you check it out and like what you see, you can sign up for life. No more recurring costs. Quality and satisfaction are affLIFT’s priorities. If you join now, check out the content and community, but if you are not satisfied, they will simply refund you if you ask. Sign up to affLIFT right here! We’ll see you on the inside. How do we spot a case study worthy of WTAFF? You’ve noticed we regularly feature case studies from all over the interwebz. You’ve asked us several times how we find so much content every day, and content that’s actually pretty darn good! Well, we thought we’d share a few tips specifically about quickly judging if a case study is worth reading or not. Here’s what we look at! First, reactions: If hundreds of people are bashing on a post, it’s probably not a good post. Such a post was the inspiration for this topic actually! Motivational fluff: If a post shows a screen of 6-7-8-9-infinite figures, but the content is all about motivation, life purpose and stuff… It’s not something we’d choose to feature. If it’s just a lead magnet: The whole thing is solely a setup for some lead magnet or for some sale. In these cases, we’d avoid it. Check the account that shared it: If the account looks fake, well, what do you want to expect from the post? Or what about a scammer? We’ve actually shared some advice we found useful but tried to warn people about the person’s reputation where possible. Who shared it is a well-known person in the industry: In this case, the post is probably going to be good. But it might also get overly-positive feedback just because of who shared it. So we look at the other factors too! Alright, truth be told, we don’t get it right 100% of the time. But at least you have an idea about our general approach for choosing case studies to feature. If we screw up, you always tell us and we correct things the very next day, if needed! Stay connected at every airport! What’s one of the best things about our job? Being able to travel whenever you want and being able to bring your job with you, right? And what is the first thing you do in an airport when you are waiting for your flight to depart? Fortunately, here comes Anil Polat! 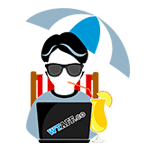 He is a computer security engineer and travel blogger and he’s got something interesting for your next travels! He launched an interactive map which offers its users Wi-Fi passwords of networks in airports all over the world. You just have to click on a specific airport and the information about the available connections instantly pop up. Polat updates this map regularly and it already features more than 130 airports across the globe. Well, you might ask: How do I use it if I have no connection? Polat thought about this too. In fact, you can even download an offline version! Now, we didn’t fly all over the world to check if the map works. And we don’t know if all the info is updated. But we hope it will help you at every airport you’ll be!